Launched in 2003, Skype was one of the first mass market freely available forms of internet video conferencing. It took advantage of early developments in Voice over Internet Protocol (VoIP) technology to allow users to communicate with each other using their microphones and webcams. Previously video conferencing had been prohibitively expensive for the general public and was largely only used by companies. The burgeoning popularity of broadband over the last few years has led to an increase in the use of a constantly improving VoIP and a surge in the popularity of Skype. Microsoft purchased Skype in 2011 for $8.5 billion, together with its database of some 600 million users. 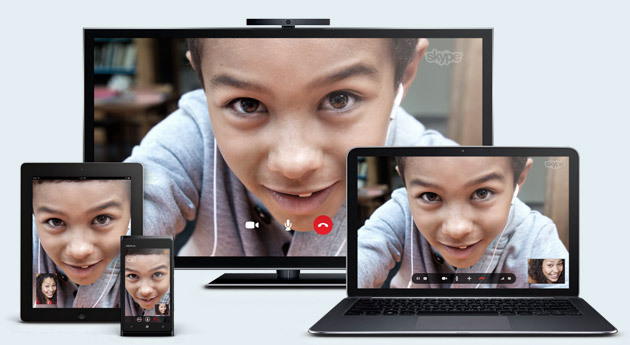 All that is required to use Skype, other than the Skype software itself, is a computing device with a microphone and webcam and a decent internet connection. Virtually all laptops now come with inbuilt webcams and microphones, as do most modern smart phones and tablets, and the necessary peripherals can be purchased for under £10 for any desktop computer, so the components required for Skype are practically ubiquitous. Other than any internet bandwidth used, there are no costs associated with the service. However, if you want to call landline or mobile numbers using Skype you will need to purchase credit or subscribe to one of their monthly plans. Also, if you want to make use of group calling, at least one of the people taking part in the group call will need to be subscribed to Skype Premium. With Microsoft’s acquisition, Skype has become more commercial and adverts now appear for non-subscription accounts. This could put off some users, but there are plenty of alternative services. Google Talk is web based so there’s no software to download. Oovoo is also free and allows up to 12 people to chat at once, but there are adverts unless you subscribe. Mac and iPhone users can use Facetime. For tech-savvy users there is Ekiga, previously only available for the Linux platform but now rolled out to Windows and smartphone platforms. Office space is expensive, particularly in London’s West End where companies spend an average of almost £15,000 per annum for the “property” associated with each workstation. In the wake of the recession, companies are increasingly considering home working as a way of reducing office rents or even removing them altogether. There is no reason why law firms shouldn’t follow suit, apart from the supposed necessity of client visits. Although much client-facing communication is done over the phone or via letters and emails, there is a traditional school of thought that face to face chats are needed to ascertain the full picture of a client’s requirements. It is often said that body language accounts for the majority of human communication – and with video conferencing, you can capture this aspect. But even if lawyers accept the idea of communicating with their clients over Skype, how do clients themselves feel? How important are those office visits? It probably depends on the type of client; how comfortable they are using internet technology and how much value they place upon meeting in “reality” rather than virtually. One should bear in mind that, according to statistics from the Office for National Statistics, a fifth of all UK households were still without internet access in 2012. So even if you decide to adopt video conferencing as a method of conducting client meetings, you should make provision for clients who either don’t have internet access or who simply prefer to avoid computers. Lawyers would be advised to assess their client base before deciding to replace face to face meetings with technical solutions. Client confidentiality has always been an important aspect of the lawyer-client relationship. Even though many modern firms primarily consist of open plan offices, separate meeting rooms are normally available for client visits to ensure a sufficient degree of privacy. The digitisation of information and efficiency of internet communication comes hand in hand with potential security risks posed by third parties – whether it’s the amateur teenage hacker or a sophisticated government-sanctioned organisation. Although most forms of VoIP provide an element of security (Skype communication uses 256-bit Advanced Encryption Standard), this is always a matter of degree. On the other hand, the phone hacking scandal shows that even traditional telephone communication is not immune to privacy breaches. So unless all communication takes place face to face in a room swept for bugs, confidentiality is something which cannot be 100 per cent guaranteed. One of the advantages of using Skype for client meetings is that, subject to data protection requirements, calls can be logged and recorded. This can be useful as an aide-memoir or for auditing purposes. MP3 Skype Recorder is a free piece of software which allows the recording of Skype conversations and can be set to record all Skype calls automatically. An alternative is Pamela which is also free to download, but a professional version will need to be purchased if you wish to record calls longer than 15 minutes. One of the issues with VoIP has always been the quality of calls – both in terms of sound and picture. Whilst faster internet speeds across the UK have generally led to an improvement in quality, it’s still not perfect. The call quality is dependent upon the connection of both parties, so you may have the top fibre optic connection but if your client is using 3G the picture and sound quality could be restricted. Lawyers whose main client base is in rural areas would be advised against relying upon Skype, because internet speeds are still largely limited in the countryside. Are any law firms using Skype? There are plenty of law firms which already offer Skype meetings. For example, Langleys asks clients to phone up to arrange a Skype call whilst Livingston Brown offers Skype and Facetime meetings subject to proof of ID. Charles Gregory provides its Skype username directly after its address, on its contact page. Watsons goes a step further and provides clickable Skype contact buttons on its homepage for each of its solicitors. In the USA, LawZam has launched a platform for consumers to video conference with lawyers online for initial legal consultations. It’s essentially a legal matching site offering real-time communications between lawyers and prospective clients in video. The combination of excessive office rents, an economic downturn and increasing accessibility to constantly improving technology is leading to a reduction in office space and a surge in homeworking by professionals across all industries. There is every likelihood that the legal sector will follow this trend and is already doing so to some extent – see the many past articles in this Newsletter on virtual practices. Some clients may continue to demand face to face meetings and body language is undeniably an important factor in human communication, but affordable video conferencing provides an effective way for lawyers and clients to meet virtually whilst retaining many of the benefits of actually “seeing” each other. Alex Heshmaty is a legal technology specialist, web marketing consultant and freelance writer. He runs Legal Techie, a niche company based in Bristol, providing web design, copywriting, social media networking and search engine optimisation (SEO) services for solicitors and barristers across the UK.